We would be delighted to host your function at the Seacote Hotel. The Seacote Hotel can be adapted to meet your needs for nearly any special occasion or function. Our weddings and functions co-ordinator Sue Mullinder has many years experience helping people create unique and varied events. She will work with you through out to ensure you get a smooth planning experience and that your event is exactly as you want it. We frequently cater for Christenings, special birthday parties or retirement parties. Set menus are available but can be altered to something as simple as providing hot drinks. Events can be hosted in our lounge bar area, restaurant or various arrangements of our function room, which can be seperated into three smaller areas, or used complete to suit up to 300 guests. 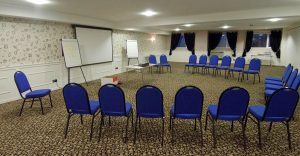 We welcome business functions and conferences and the room can be laid out either in a small, seminar style space or lecture hall style. Our raised stage area in the central function room makes it ideal for many different uses and the spaces can be used as different areas throughout the day. We welcome rallies and have the potential to take large groups when combined with our neighbouring caravan site. Please call us today on 01946 822 300 to discuss your requirements.